At Bike Fisherman we have received many raving customer reviews and we have decided to share some of them with you. And if you would like to share your experience with others you may Write Your Own Testimonial Here. There is a place where I go fishing where cars aren't allowed, so you park in a lot and you have to hike it about 2 miles which we use to do. Then I had the idea of taking our bikes with us. On our first couple of trips, we just carried our rods in our hands which was dangerous. We then tried to make rod holders out of PVC tubes but that didn't work out too well either. Then I stumbled onto Bikefisherman and never looked back. Easy to install and works like a charm. Great product that has turned my fishing experience much more enjoyable. The simplistic durable design can take a beating from branches, rocks and mud this thing is nearly bullet proof and I believe will last as long or longer than any bicycle. 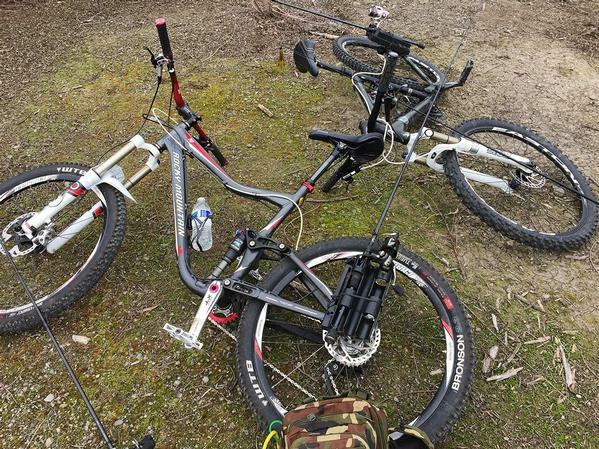 However you still need to be mindful of your rod tips when riding under low brush. I kind of forgot that I had rods on board since they are out of the way securely stowed behind your seat and nearly snapped a tip on low hanging branches. The Bike Fisherman is ideal for bass fishing, trout and panfishing gear but not ideal for fly or surf rods. The price is reasonable $36.95 with free shipping and USA made. The inventors Marlana and Pete are a pleasure to deal with and stand behind their product. If you use a bicycle to get to remote fishing spots, give the Bike Fisherman a try. The Bike Fisherman is awesome! What a great invention. It fits securely on my bike and keeps my poles safe and secure. No more trying to hold fish poles while riding my bike. Thank you! This was the best fishing buddy any one could have with them. But they stole my bike and stole my buddy. Need another one now! I was looking for a way to carry my fishing poles on my Bike without damaging them and I found The Bike Fisherman during a Google search, this is just what I wanted ! Easy to install and it keeps the rods out of harm's way . Thank you guys ! The picture is along the Lehigh Canal in Allentown,PA. I purchased the Bike Fisherman as a gift, so I cannot attest to the actual product, but what I can tell is how wonderful the customer service is! I contacted them asking if they could not include the packaging slip (since it was gift) and to also include a birthday message with the Bike Fisherman. They were prompt, polite, and happy to oblige. I really appreciated that they included a birthday message. The gift was shipped immediately and was received within 2 days. I would gladly purchase from them again! I had always put my fishing poles in my backpack sticking out or by hand riding my bike. Once I saw this, I had to have it. I have used it now for 2 years and I love it. A SIMPLE YET EFFECTIVE ACCESSORY! If you ride a bike to go fishing then this item is a must. This makes for the easiest way to transport your poles by bike. Great item you will not regret paying for this. 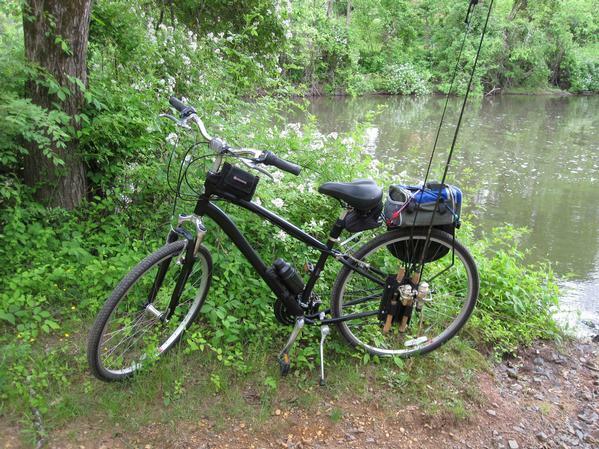 I mostly use my Bike Fisherman along the Delaware-Raritan Canal towpath in Central New Jersey. Trying lots of spots along the many miles of canal is a breeze on my bike, now, whereas before I was much more limited being on foot. 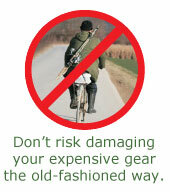 Using Bike Fisherman is also very safe for me and my gear while riding. Since I mostly use ultralights, I add a small bungee cord just to keep my rods and reels even more secure. We live about about a mile from the river and purchased our Bike Fisherman earlier this year. It is great and works really nice to carry our fishing poles. I ride my bicycle as often as possible. It seemed a shame to have to take the car to fish with my 11-year-old, when the river is just a few miles up the road! I managed to install Bike Fisherman in just a minute or two... and off we went! Fast and easy installation! Add two poles, grab your tackle-bag, and easily get to spots off-road. Save gas, save energy, get a little exercise, and most importantly, FISH! I recommend this as a high-quality and inexpensive answer to bike-fishing - you couldn't build your own for less and surely not any better! The Bike Fisherman fishing rod holder is an awesome product! Installs easy, looks great and works perfectly. Every local bike shop should have one in stock because everyone that sees mine is really impressed with the idea. Best bicycle accessory ever. I bought a pair of these for my sons. I was concerned about the way they were carrying their fishing rods while riding to and from the fishing hole...wasn't safe for them or their equipment. I received the rod holders and installed them on their bikes. It provides a good secure way to take their fishing rods with them and they can concentrate on riding safely. Great product! One thing I did notice during the mounting process is that the loop clamps (both sizes were) too small for both of my son's bikes. I ended up modifying the largest size clamp so that it would work. 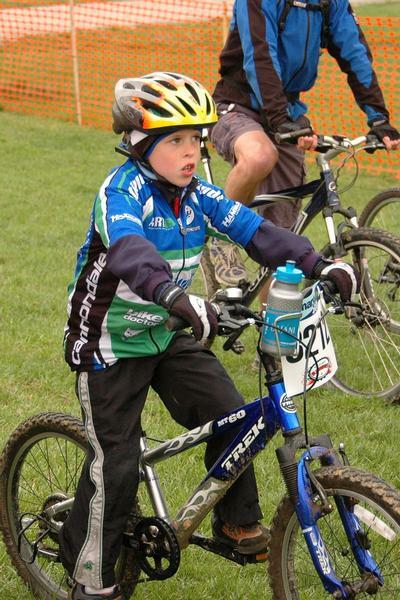 My son's bikes are fairly common mountain bikes and the rear triangle tubes are simply too big for the clamps that come with the holder...maybe consider a 3/4" or 1" option for the future. Otherwise I am extremely satisfied with the product. Thanks.! I live in Scottsdale AZ all winter where there are a large amount of urban lakes. They are more accessible by bike than by car. I now use the Bike Fisherman when I do my daily bike rides on the paths around the lakes. My boys ride their bikes nearly every day to go fishing. Until purchasing the Bike Fisherman, I was replacing broken poles every other week. The Bike Fisherman works perfectly. 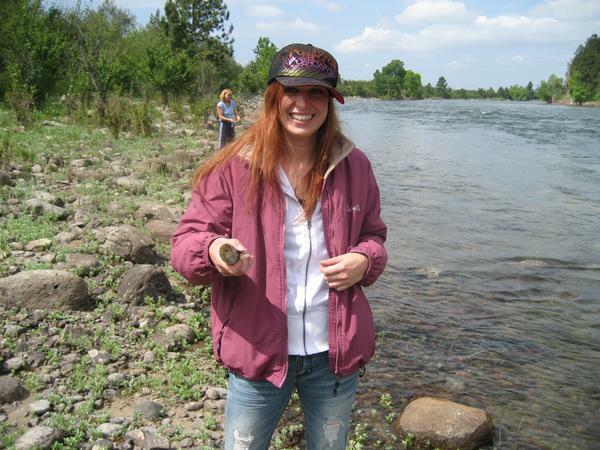 This is just one of the many small mouth bass I have caught on the river using my bikefisherman to carry my poles on my bike to my favorite fishing spots. I love my bikefisherman. 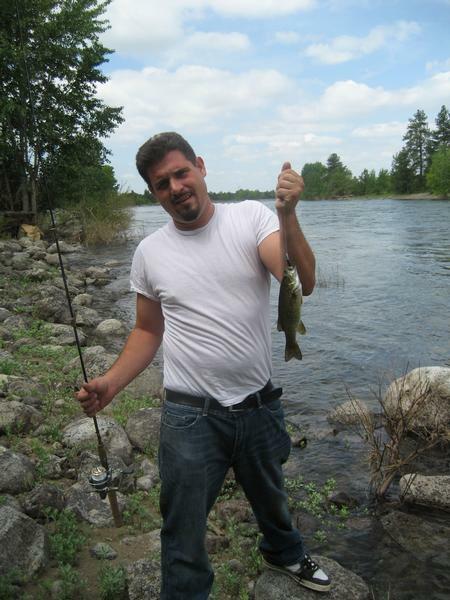 I can now get to fishing holes that are not accessible by motor vehicles and consistantly bring home fish like the one in the picture, a 4 lb. rainbow trout. My boy friend and his parents took me fishing for the first time in my life. 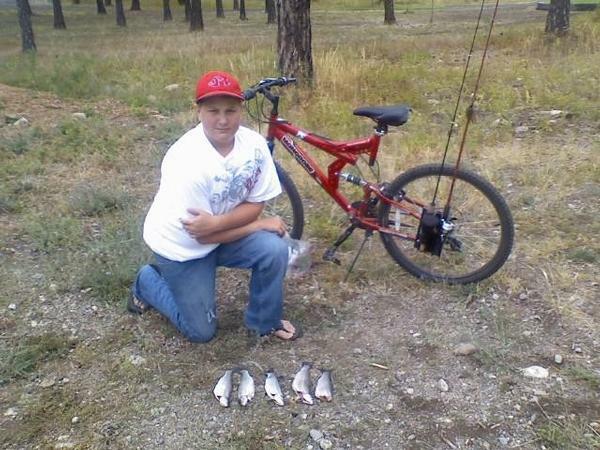 We rode bikes to an awsome fishing spot that we had all to ourselves and I cought my first fish. It was small, but still exciting. I had not been on a bike for 15 years, so I guess it is true that you never forget. The whole experience was a blast. The first time I used my bikefisherman I cought 5 small mouth bass. I fished in an area where the only way in was by bike or walk and had the entire river bank to myself. Installation was a snap and the poles stayed secure in the holder even when I went over rocks.